Action Centered Leadership (ACL) focuses on what leaders and managers need to do to be more efficient. There three fundamental components to management and leadership that can be learned. This article describes Action Centered Leadership (ACL) by John Adair in a practical way. After reading you will understand the definition and basics of this powerful leadership theory. What is Action Centered Leadership (ACL)? British leadership guru John Adair is the inventor of Action-Centred Leadership (ACL), which he describes in his book ‘The Skills of Leadership‘. According to Adair, leadership doesn’t depend on a person’s characteristics, but is something that can be learned. Additionally, Adair distinguishes between leadership and management. He believes that management is rooted in the organisational system. Operational leadership, where several team leaders report to one superior. Leadership on department level, where it concerns departments of five to 20 people. Strategic leadership of the entire organisation, where the leader is responsible for all the levels below him. Additionally, the Action Centered Leadership model is easy to apply and to maintain. Leaders must be able to focus on a few fundamental matters; developing strong teams, increasing productivity, improving the work quality, achieving strong results and building work ethics (the positive attitude employees take towards the work they do). 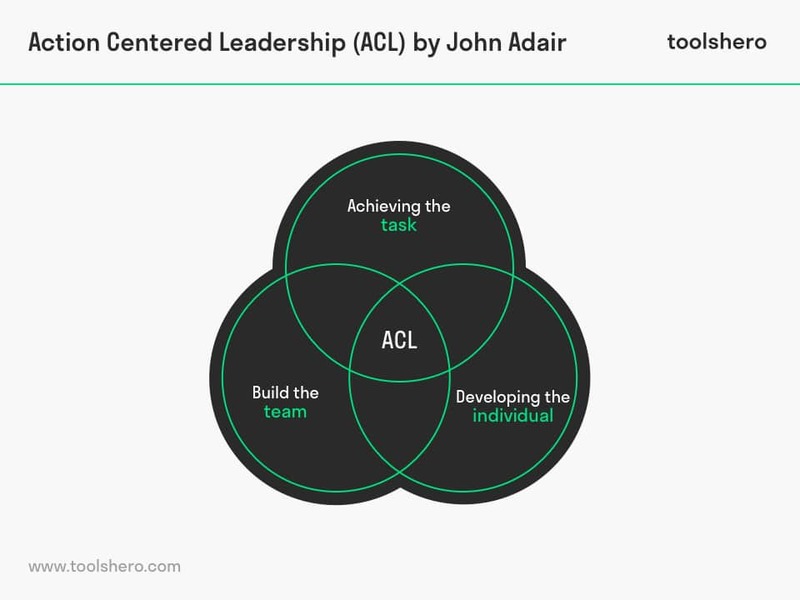 In Action Centered Leadership (ACL), Adair defines three overlapping and connected circles. Because leadership is exercised on every level, the task, the team, and the individual within organisations must constantly be taken into account. After all, employees expect their leaders to help them achieve the joint task, to contribute to the cooperation and synergy of the team or department and concern themselves with the needs of the individual employee. Subsequently, these three circles are interdependent. The Action Centered Leadership model is independent of the situation or organisational structure. It could help leaders to identify where exactly they lose control over the group or situation. Tasks must be carried out by employees. Leaders must have insight into the positions and the accompanying tasks, allowing for guidance and supervision. Without tasks, there is no insight into results. Teams are the axis of organisations. Departments have their own speciality. By investing in a good team and by maintaining harmony among the various team members, a leader can create continued coherence. Team spirit leads to productivity and good results. The leader is responsible for each individual employee, his progress and development. Each individual needs recognition by means of salary, fun and challenging work and responsibility. The leader must have open lines of communication with his employees and monitor their achievements and performance. Conscientiously completing a task makes an individual employee feel satisfied about his work. Moreover, this increases the team spirit, which benefits the working atmosphere and allows people to help and support each other. A properly functioning team offers a safe environment in which individual employees can work comfortably and support each to achieve the best results; this benefits the individual completion of the tasks. The execution of the tasks leads to an excellent result. The need of each individual employee is important. When this need is not considered or met, employees are not able and/or motivated to carry out their tasks properly. Consequently, they aren’t open to good contact with the other team members and there will be no team spirit. Both for the individual employees and for the team (the department itself), it should be clear what tasks and goals they are working on and in what timespan the tasks must be completed. Following the defining of tasks and goals, it’s important that a clear time plan is included. This means that employees know when a deadline is approaching, but also what is expected of them in the meantime. It is the task of a leader to inform his team/department of a team briefing or work meeting, for instance. This open communication creates a good atmosphere and advances collaboration. Leaders shouldn’t just have control over their own performance and functioning, but also make sure they have good control systems at their disposal. For instance, think of effective delegation and monitoring systems. Following controlling, it’s important that leaders are able to evaluate and can evaluate and assess both the team achievements and the individual achievements based on this information. It’s the task of the leader to properly organise himself, the team/department, and structures and processes. Following what belongs to the 6th leadership function, it’s important that a leader sets the right example for his employees and his team. Always set a good example. The leader is the person who establishes responsibilities, including objectives and measures. This means that, according to Action Centered Leadership, the leader sets the norms and standards and checks and reports on the achievements and progress of the general goal of the team and the individual employee. With regard to the individual employee, the leader has the responsibility to discuss and evaluate the personal skills and results. In conversations with employees, he’s responsible for asking about the personal needs and to facilitate further development of the employee. What do you think? Do you recognize the practical explanation or do you have more additions? Is Action Centered Leadership (ACL) applied within your organisation? Do you think leadership can be learned? Adair, J. E. (2006). Leadership and motivation: the fifty-fifty rule and the eight key principles of motivating others. Kogan Page Publishers. Adair, J. E. (2007). Develop your leadership skills (Vol. 11). Kogan Page Publishers. Braun, F. C., Avital, M., & Martz, B. (2012). Action-centered team leadership influences more than performance. Team Performance Management: An International Journal, 18(3/4), 176-195.